We have found 15 Trending Nail Designs That You Will Love! Nail Designs are always popular and the more creative the better. Finding nail designs that really strike your eye is also fabulous because it makes you feel good every second of the day that you are looking at your nails. You also will be receiving compliments at all hours of the day. 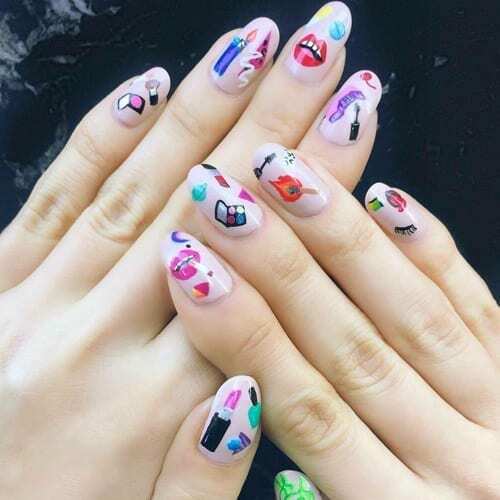 We hope that these 15 Trending Nail Designs inspire you to get your nails done by a nail artist or to do them yourself! These nails are so pretty! The white colored polish along with the pink colored polish is always a great combination. It’s very cute how three of the nails offer the white lacquer and the other two nails feature the pink. The bedazzled accent is a neat touch! Wow! Look at all of these pretty colors together as one! Sohotrightnail did an amazing job with these nails featuring so many different colors while also showing off the natural nail color. It actually looks like they use different acrylic nail lengths to create this display. Truly amazing work here! Who knew that gold and soft purple could go so well together? The nail artist above sure knew! These nails are gorgeous and the random selection of gold speckle and glitter makes for a great look. The coolest thing about being here at Best Nail Art is the creativity we get to witness. Take a look at the above nails for instance. Here we have white and gold as the main colors and you still get a unique design. The futuristic french tips along with the gold glitter and to top it off with the accents is truly remarkable. These nails feature a bold look with the all black color and the glitter on certain nails. These acrylic nails all feature a unique display of what nails should look like when you have an important event or party coming up in your life. All you need is love! You literally are showing off love and your heartbeat with these pretty nails above. The love written out and the adorable heartbeat with the pulse outline is beautiful. The black color also contrasts greatly with the soft shade of pink polish. This is the definition of springtime and summertime nails. Each nail features a hand drawn sunflower over a light blue sky. It doesn’t get much prettier than this if we do say so ourselves. Whoa! Now this picture is up close and personal! No girl would dare to take a picture of their toes that closeup without the perfect pedicure in place right now. The purple glittery nail polish looks amazing with the skin tone color of this girl’s toes and feet. This is the perfect color for nights out on the town in your favorite open toed shoes. Very pretty! The shiny look to these nails is something that really gets us going. Also, the added jewelry aesthetic makes this look incredible. This luxurious display of nails even features a thin glimmer of gold glitter surrounding the bottom of the nails. We love this! In the nail image you are looking at above, you will see so many different girly type things. Some of those things includes a pair of lips, lipstick, eye lashes, makeup and a bunch of other interesting things. If you are a bad girl by heart, this manicure is for you! There is something refreshing about the simplicity of this one. You will see a few different shades of lacquer like maroon, purple, silver and pink. When you add all of these together, along with separating the fingernails, the contrast offers a simple beauty you can’t find elsewhere. This manicure can be done at home too which is a plus. These nails are amazing! The only two colors you will see in this manicure is black and white. Even though those are the basic colors of life, they turned that basic feature into an asset. This is well done and we couldn’t be happier! The regular style of french tips can get quite boring after seeing it done so many times. What we have here is a futuristic approach that is stunning. Not to mention the one nail that looks like you dipped your finger into a treasure chest. Bravo!